Ash Soan and The Producers dropped into ACM Guilford last week, and the all-star supergroup made quite an impression. The band, which sees Ash team up with Lol Creme, Trevor Horn and Steven Lipson, performed at the music school on 2 March. ACM's Head of Audio Production Antony Greaves said: "ACM is used to having true legends walk the halls of the Guildford campus, and having The Producers in has once again raised the roof with excitement. In a year that had already seen the likes of Chad Smith, Roger Taylor and Fraser T Smith visit ACM, thestudents will be talking about The Producers for some time. 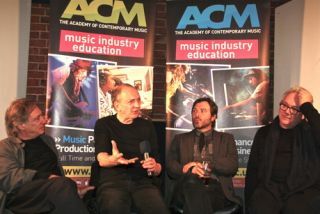 "Let's face it, having such immense talents as Lol Creme, Trevor Horn, Steve Lipson and Ash Soan hang out with students and perform to the entire Academy could only ever be a big hit withthe industry's future stars." For more on Ash Soan and The Producers pick in the April issue of Rhythm, on sale 13 March.